My path to being published was typical of most first-time authors - seven years of plotting and re-plotting, writing and rewriting, and endless bouts of writer’s block. After completing and editing my first draft, I went on the hunt for a literary agent. Ultimately, the very first agent I pitched to ended up accepting me as a client, a year, two hundred other agent rejections, and six rewrites after my first pitch. My agent tried to sell my novel to about ten different publishers with no success, so dejected, I decided to go the self-publishing route and let readers decide. I spent every free minute promoting the novel, giving book talks, advertising on Google and Facebook (a complete waste of money), and sending the novel to bloggers and reviewers. Ultimately, the book sold and was reviewed well. Well enough, in fact, that my current publisher – Open Road - picked it up as an official title, and, shortly after, Audible produced the audiobook. 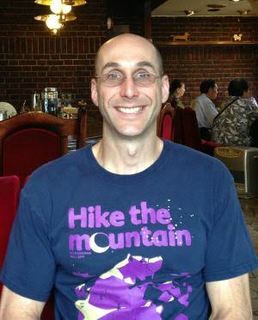 Ultimately, I gleaned three key lessons from the experience. First, it’s critical to learn to accept rejection when hunting for an agent/publisher – it’s inevitable. Second, it’s important to take agent feedback (however scant) and use it to improve your story. And finally, grit conquers all – never give up! It’s fun to just sit down and write and see where the story goes. I love watching how the characters take on a life of their own, get themselves into trouble, and often pull the story into completely unanticipated and exciting directions. The biggest chore was slogging through major rewrites. Often what seems like a small change, for example adding some dialog between two characters, causes major ripple effects throughout the rest of the novel. The change might result in a different emotional state for the characters, might inadvertently foreshadow some scene later in the novel, and so on. So even small changes require you to carefully reread and potentially edit large parts of the story to ensure consistency. While rewrites are a critical part of the writing process, they’re a huge drag. While I wrote the first draft of my novel, I didn’t bother organizing my time. When I felt like writing, I sat down at my desk with a glass of red wine and wrote. That took most of the pressure off, and made the experience far more enjoyable. That said, once I began pitching to agents and doing rewrites, I stuck to a very organized schedule, dedicating every free weekend and evening to finishing the changes. While you do have 2 other published books, they are both non-fiction works on internet security. 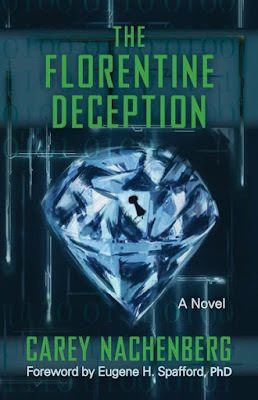 What challenges did you face switching genres and writing a fictional cyber-security thriller - The Florentine Deception? The biggest challenge in transitioning from non-fiction to fiction was character development. Constructing a character from scratch, really getting into their head, and making sure their behaviors were consistent with their personality and challenges they were facing was really difficult. To address this challenge, as with many new authors, I initially modeled my main characters after people I knew well. Over time, I became more empathetic with my characters and this became much less of a problem – in fact, it was really a lot of fun to develop and watch my characters grow. Where did the inspiration for this story come from? The characters? Are any characters based on people you know? I wish I could say that my story was inspired by some idea or event, but I’d be lying if I did. If anything, my initial motivation was to expose everyday folks to the fascinating world of cyber-security. So, if you listen the audiobook, in addition to enjoying an exciting adventure, you’ll also gain a very realistic understanding of how fragile our digital world is, and how easily it could be disrupted by folks with evil intent. That said… some of my characters were inspired by friends and family members. My Papa character, for example, was directly modeled after my wily paternal grandfather. He gives the adventure a comic angle, and I’ve had many readers tell me that he was their favorite character. I think if Papa were still around, he’d be happy to know that. What inspired your decision to donate 100% of the proceeds from sales of The Florentine Deception to charities supporting under served students and veterans and who are some of the charities/people that will benefit? My feeling is that we need to help people as early as possible to get them on the right trajectory in life, so that’s why I decided to donate all of my proceeds to children’s/young adult charities. I’ve selected five charities to support; all of them are focused on helping underserved students. Several of the charities enable inner-city students to attend free charter schools; one charity helps students get professional training and then places them in internships in high-tech companies. How much has been raised to date and how much do you hope to raise? My pledge was to donate $5 per book for the first 2,000 copies of my novel sold, up to $10,000, then donate 100% of my proceeds per book (probably $1-$1.50 per copy sold) thereafter. So far I’ve donated over $8,000 from sales of about 1,600 novels, and I’m about to donate another $3000+ based on a recent spike in sales! What's next for you in terms of writing? Will you be releasing any more books in this genre to further raise money for these charities? I’m noodling over several new projects, but so far I haven’t settled on anything. Frankly, writing the novel was such a massive undertaking – both in terms of time and emotional ups and downs – that I’m not quite ready to jump into a new project. But if and when I do, I'll definitely want to use it to help less fortunate folks.